Rheumatoid arthritis is a most common type of inflammatory arthritis. It is a condition which causes pain, swelling, stiffness and loss of functions of the joints, mostly hands, feet and wrist joints are affected. Herbal remedies for rheumatoid arthritis help to manage the condition. Rheumatoid arthritis is an auto immune disease. Here immune system attacks the cells that lines joints and make them swollen, stiff and painful. Immune system usually fights against infection and protects us. Rheumatoid arthritis can occur at any age, infect children can also face but mostly it occurs in young to middle adult years. Women men ratio is usually 3:1. In the U.S, approximately one percent of the population or 2.5 million people have rheumatoid arthritis. It occurs in all ethnic groups and in all parts of the world. How R.A differs from O.A? Osteoarthritis is a common type of arthritis which occurs mostly in old age where as rheumatoid arthritis is an auto immune disease that happens when own immune system attacks over the body tissues due to its weakness and besides joints R.A can affect eyes, lungs and mouth also. When immune system is triggered, immune cells get divided from the blood and go to joints, joint lining tissues called synovial where immune cells make inflammatory substances that lead to irritation, wearing down of cartilage, sweeling and inflammation of the joints lining. As the cartilage wears down the space between the bones get narrow which causes their rubbing against each other. Inflammation of the lining of joints causes fluid to build up with the joint. All these things make joints painful, tender, and warm to touch and red to look. What are causes and symptoms behind it? Exact causes are not known that why this painful condition takes place but genes, hormones and environmental factors are responsible somewhere. Symptoms include – swelling, pain and tenderness of joints of body like hands, feet and wrist. These vary from person to person and may come and go. Sometimes person with R.A can experience flare – ups when condition with symptoms is severe and worst. R.A causes swelling or inflammation around the joints such as rheumatoid nodules. It can affect other body parts also like inflammation of the tear glands, inflammation of the salivary glands, inflammation of the lining of the heart and lungs. Pain – Pain in R.A is throbbing or aching sort of. It worst usually in the morning and even worsts more after having rest. Stiffness – There is joints stiffness which also aggravates during the morning time. Morning stiffness is a sign of osteoarthritis also that goes off usually within half an hour but in rheumatoid arthritis it takes a long time to go. Redness with warmth – The lining of the joints that are affected is hot, painful and tender to touch. They appear red in color. 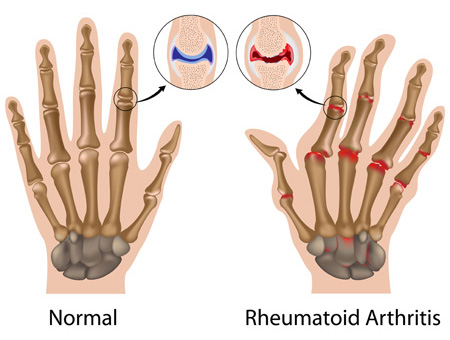 What is the ayurvedic treatment for rheumatoid arthritis and how can it be managed with herbs? Ayurvedic medicines for rheumatoid arthritis or herbs that are beneficial in subsiding symptoms and managing rheumatoid arthritis are ashwagandha, shallaki, laksha, haridra, guggul, giloy, nirfundi, shunthi, punarnava, methika, gorakhmundi, trivrit, devdaru, daruharidra, pippali mool, chitrakamool, pushkarmool, amalaki, haritaki, babhitaki, mustak, chavya, vidanga etc. Herbal formulations like Aamvatantak Churna, Joint Aid Plus, Boswellia Curcumin and Ashwagandha Capsules make Rheumatoid Arthritis Cure Pack of Planet Ayurveda. These herbal remedies contains above said wonderful herbs acts on immune system, joints and muscles to manage the aggravated signs and symptoms of R.A like inflammation, tender and warm red joints. These herbs are very well explained in ayurveda for their actions and properties. JOINT AID PLUS – It is a complete solution for all types of arthritis by Planet Ayurveda that contains really efficient herbs in it like Ashwagandha, Shallaki, Shunthi, Guggul, Guduchi and Nirgundi. All these superb herbs are well known for their actions and properties in ayurveda with best anti-inflammatory, analgesic, immunity modulator and antioxidant too, So help to reduces pain, tenderness, inflammation of the joints and gives relief. This is a most effective product recommended in Rheumatoid Arthritis and it has helpful effects in all types of joint pain. ASHWAGANDHA CAPSULES – Ashwagandha is an valuable herbal remedy by Planet Ayurveda which believed to work in issues related to Fatigue, Weakness, Stress, Rheumatoid arthritis, Osteoarthritis, Cervical Spondolysis, Heart diseases, all Neurological diseases and other many ailments. Our Ashwagandha is a wonderful product made from 100 percent pure standardized extract of best quality Withania somnifera. It is a Rasayana which acts as Anti-inflammatory, Analgesic and very strong Antioxidant. Apart from this, Ashwagandha enhances and nourishes the brain also. It works wonder in male sexual system. BOSWELLIA CURCUMIN – Another product by Planet Ayurveda which is recommended with other products to manage R.A is Boswellia Curcumin. It is a product that contains best Anti-inflammatory and Analgesic herbs, Shalakki and Curcumin in it. which helps to reduce the signs and symptoms of Rheumatoid arthritis like inflammation, pain and stiffness of joints. These herbs suppress the growth of inflamed tissues as well as preventing the breakdown of the surrounding connective tissues. This is a most effective product recommended in Rheumatoid Arthritis and it has positive effects in all types of joint pain and painful conditions. AAMVATANTAK CHURNA – Rheumatoid Arthritis is known as Aamvata in ayurveda. Aamvatantak churna is an astounding and unique formulation by Planet Ayurveda. Amvatantak churna contains herbs like ashwagandha, methika, shonth, gorakhmundi etc. These medicines are Anti-inflammatory; Analgesic; Antioxidant and Immunity booster so help to reduces pain, tenderness, inflammation of the joints and gives relief. 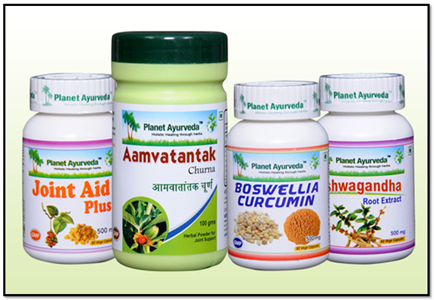 Aamvatantak churn also help in nourishment of joints and gives strength to the joints as well as body too. Therefore we can say that Aamvatantak Churna is recommended to preserve overall health of the body. Aamvatantak churna is 100 percent natural product that contains no chemical or preservative. Click here to buy Rheumatoid Arthritis Cure Pack for the treatment of rheumatoid arthritis naturally. 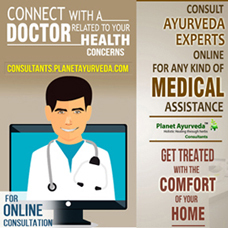 We at Planet Ayurveda provide you all very effective and beneficial herbal formulations which are 100 percent natural and known for not to have any side effect because we consider that your health is our responsibility! !